Pauline, you are very good at being unintentionally racist. I thought knives being aggresive was a stereotype? Still, that guy didn’t look like the sharpest knife in the drawer, as it were. He’s not being very knife. He’s had a bad attitude ever since his wife ran away with the spoon. 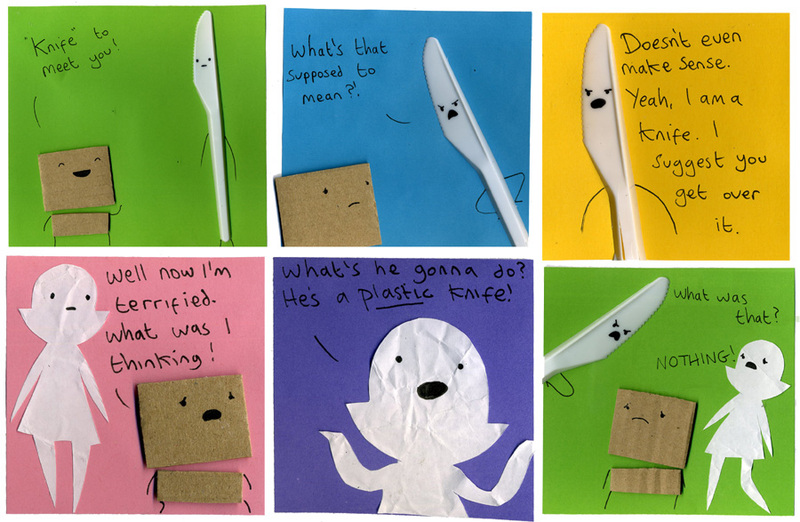 I think Knife’s just misunderstood & easily upset by cutting remarks. Poor Knife. He’s always been a little on edge. A plastic knife could still do some real damage to paper and cardboard. Colin and Pauline had better not make him any angrier. How did you get the knife a bit smaller in the first panel? I love this one btw its funny Doctor Band-aide can do it! Something about the expresion on the knifes face in the first pannel cracked me up. I like the cut of his jib, he gets straight to the point. And so long as people keep making puns there will never be a dull moment around him.